The feast of the Mother, a recurrence spread throughout the world, although in some countries it is celebrated at different times. In Italy, the first celebration dates back to the late 50s and since then on the second Sunday of May. To celebrate the Day this year I thought of something special, but especially scenic. 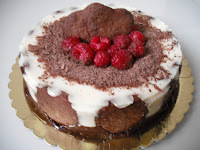 I suggest this recipe alternative to traditional cake shaped like a heart, a Bavarian chocolate. you can prepare it with either white chocolate or dark chocolate with. Or, as I did, with both chocolates. In addition, the recipe for Bavarian with hearts melting is also perfect to celebrate Valentine's Day with a their own half of the heart. You can in both cases, if you prefer, you can also use a springform pan opening in the shape of heart. In any case, the heart is a symbol to show all the love to those who love each other. Cream the butter with the sugar until you get a well whipped cream. Add the cocoa and chocolate previously melted in a double boiler and mix until a smooth cream. Dissolve the salt in the milk and add it to the cream obtained, then add the flour with the starch and baking powder. Mix slowly until dough is omogeneo.Lasciare the dough rest in the refrigerator wrapped in plastic wrap for 30 minutes.After having spread a layer of about 8 mm cut the dough with a cutter in the shape of heart and bake on greased baking sheet or parchment paper for 10-15 minutes at 180 ° C. Turn off the oven. Remove the cookies from the oven and let cool on a wire rack. then put in the oven to dry off but still warm, until the oven has cooled down completely. First thing to do Soften gelatin in cold water. Melt the white chocolate in a double boiler. In a bowl beat the eggs with the sugar, mixing well so do all the sugar dissolve well. In a small saucepan heat the milk with the vanilla, turn off the heat. Add the milk a little at a time, to eggs. Stir constantly. Put everything in a saucepan and bring to a boil, stirring constantly with a wooden spoon. (If you want you can add a third of the compound of dark chocolate, melted in a double boiler. And continue cooking the mixture in a saucepan a part.) Add the white chocolate liquid. Stir ancora.Appena begins to boil, turn off, stir the gelatin one at a time, stirring constantly and let cool. (14 sheets for the white chocolate mixture and 6 sheets for the compound in dark chocolate.) When the mixture of eggs, milk and sugar is just warm, whip the cream with a mixer, and stir in white chocolate (and possibly a third of cream to the mixture dark chocolate). Take a springform pan openable round of 20 cm in diameter, and cover only the bottom of baking paper slightly wet, so as to adhere to the pan. Insert inside, around the edges of the pan, the hearts of chocolates upside down (with the tip at the top). Pour half of the white chocolate mixture. Place the raspberries inside. Leave aside 50 g raspberries for the final decoration. Pour the remaining chocolate mixture white finish with the mixture of dark chocolate, in case you have prepared. make firm the Bavarian. Refrigerate for at least 2 hours before serving. Remove the cream from the refrigerator. Turn the mold in a dish portata.Aprire the springform pan gently. Remove the paper from the surface of the Bavarian oven. Grate on the surface of chocolate. Decorate with raspberries in the center have been set aside. At the center insert two hearts of chocolate chip cookies. Do you want to speed up the preparation time? Buy prepared for creme caramel and dark chocolate pudding and replace them to the mixture Bavarian. Remember, though, to add to the product, two tablespoons of cornstarch for each compound chocolate. For the cookies, you can replace them with dark chocolate cookies that are for sale at the supermarket! You'll get a good result with less effort!